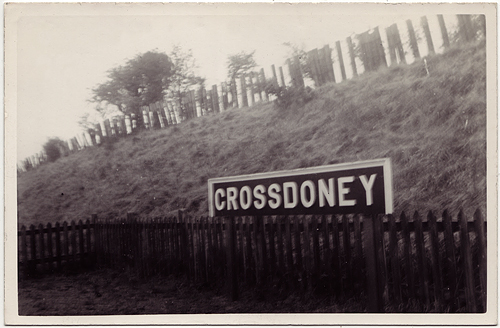 For nearly one hundred years, the Midland Great Western Railway serviced the small County Cavan village of Crossdoney. This station, along with many others, closed in the mid-twentieth century. Only one third of the 5,600 km (3,480 miles) of track that existed in 1920 remains today. Many border counties, such as Cavan, are now without a rail service. The remaining rail infrastructure and stations are beautifully recorded on the Eiretrains blog and you can see photographs of the near derelict station at Crossdoney here. This photograph was printed on a postcard and may or may not have been available commercially. I cannot imagine that this odd and slightly blurred image was a big seller. Perhaps, it fits into the category of ‘boring postcards’ although I think that there is more to it than appears at first glance. Essentially it depicts nothing more than a sign and some railings, however, it also marks a very specific geographic location and signifies the way in which the railway connected such locales to the wider world.